All homes currently listed for sale in the zip code 90807 as of 04/23/2019 are shown below. You can change the search criteria at any time by pressing the 'Change Search' button below. If you have any questions or you would like more information about any Long Beach homes for sale or other Long Beach real estate, please contact us and one of our knowledgeable Long Beach REALTORS® would be pleased to assist you. "Located in the exclusive Virginia Country Club enclave, this 2-story Spanish home has been updated throughout with exquisite attention to detail and the finest of craftsmanship. 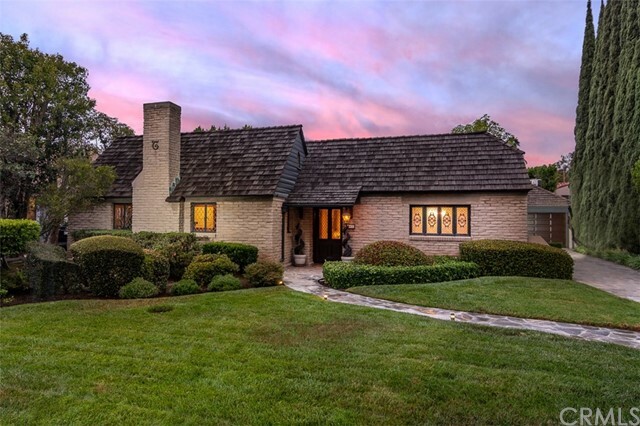 Coved ceilings, arched windows, faux painting, hardwood flooring, built-ins, architectural niches, modern lighting features that mimic the 1930's, and custom wrought iron gates are found throughout the home. The breathtaking kitchen has been lovingly refurbished with two-tone custom cabinetry, granite counters with bright Mexican tile back splash, under counter lighting, lovely windows out to the veranda, stainless appliances including a Liebherr fridge. OC artist Susan Marosz has painted a charming mural in the eating nook. 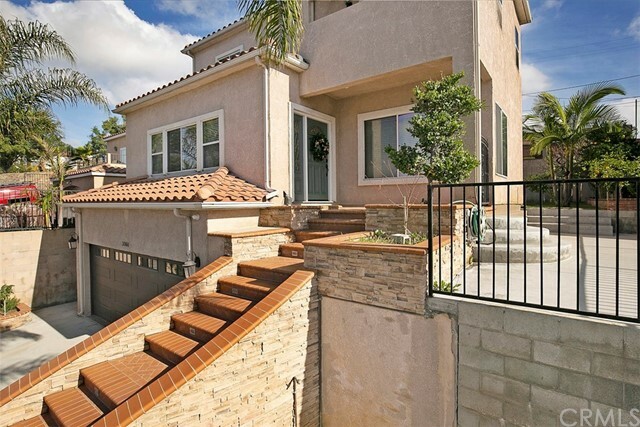 A stunning Spanish tile & wood staircase leads to the 2nd floor with 3 bedrooms, including a spacious master suite, with a crisp white tiled shower & soaking tub. A front facing balcony is found off of the guest room. Each bath is uniquely styled, one having a rich marble inlay floor. Burn those calories in the balconasium a 3 sided room (balcony) with stunning views of the artfully designed landscape. From the balconasium descend from the metal spiral staircase to the inviting back courtyard. Enjoy the 200 sq ft basement with wine cellar. 3 car garage. The lushly landscaped grounds are perfectly poised for entertaining. Los Cerritos Elementary & Hughes Middle School. Near the Blue Line and nightlife of Bixby Knolls." "Stunning single level English country manor, nestled in the coveted enclave of the Virginia Country Club. Expansive yet intimate, this home exudes old world charm with modern conveniences. Architectural details abound: exposed stone walls, hardwood floors, custom mahogany paneling, built-in cabinetry and custom mill-work, wainscoting, leaded and stained-glass windows. An entertainers dream: from the limestone/tile entry that leads to the dramatic formal living room with a beamed and vaulted wood ceiling and grand stone fireplace, the tour just begins. The den features a stone Normandy fireplace, vaulted ceilings, stained glass windows, mahogany paneled library area with a wood coffered ceiling, cushioned reading alcove, and a vintage wet bar. The hall, with its inlaid hardwood flooring and recessed lighting, leads to 2 guest rooms, modern bath and the stunning master suite with original French inspired floors. The master bath features tumbled marble tile, bathtub, separate shower, and large walk-in closet. The formal dining room features, leaded windows, parquet floors, wainscoting, and crown molding. 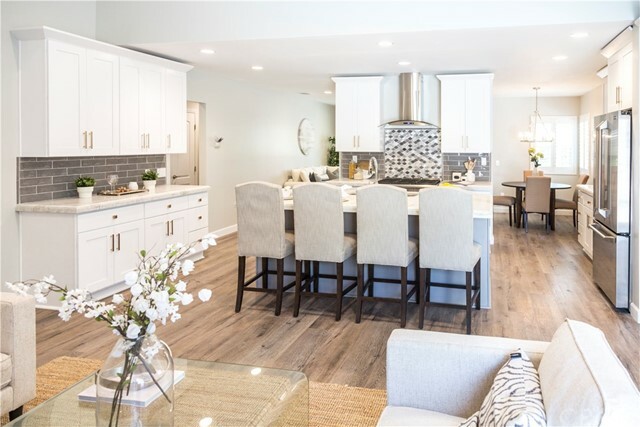 The elegantly remodeled kitchen boasts designer SS appliances, granite counters, and custom cabinetry, adjacent is a breakfast room with built-in china cabinet and hutch. The grounds are abundant with towering trees and mature specimens. Flagstone walkways and patios and a crystalline pool and spa make this home a tranquil private oasis. A home of impeccable taste and luxury." "Gorgeous & Immaculate describe this Craftsman Gem located in Virginia Country Club! Built in 1915 this home has withstood the test of time. The attention to detail throughout this home is priceless & timeless. The curb appeal pulls you in with the mature landscape, a beautiful lawn & the welcoming front porch. Upon entering the home you will notice the lovely hardwood floors, the spacious living room with an Americana flair worthy of Architectual Digest & the built ins flanking the fireplace. The dining room has unique built ins & lead glass French doors leading to the front porch. The den's charm is enhanced by the built in & the lead glass windows. The huge eat-in kitchen was remodeled with quartz counter tops, beautiful appliances, ample storage & overlooks the pool, spa and pergola. The Sport Court is well maintained and is set up for Pickle Ball, Paddle Tennis, Volleyball & Basketball! Privacy is no issue with a 12 ft wall of lush greenery! Upgrades include the cedar siding has been meticulously replaced, the pool & spa were replastered & equipment updated, pool hardscape with interlocking pavers & new gazebo, copper plumbing,replaced forced air heater, electrical panel, new hardwood flooring & 2nd walk-in closet added in master plus dual pane windows in 3 of the bedrooms. The upstairs is a heavenly oasis! Conveniently located near restaurants, shopping, churches, Virginia CC, 405,710, 105,110 freeways. Don't miss out on calling this one your home!" 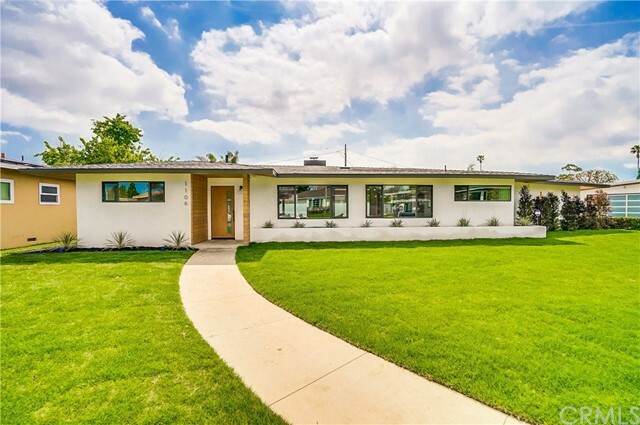 "Spectacular newly remodeled SMART Mid-Century modern home in bixby Knolls. This lovely house will surely impress your family and friends. As you enter the house you will marvel at the abundance of natural light. You will also enjoy the look of this inviting blue water sprawling swimming pool from every corner of the house. Beautiful Hardwood floors, windows and French doors all around the house flooding the house with natural light. Two fireplaces one in the living room and one in the family room. The newly designed kitchen will inspire you with its openness and beautiful Calcutta quartz counters and high quality appliances. A large family room , complete with a full wet bar, fireplace and french doors opening to the beautiful backyard. A luxurious master suite with walk in closet and french doors opening to Backyard. A new roof and a large 2 car garage attached to the house. Electric and plumbing has been fully updated all throughout the house." "Don't be fooled by the classic look of this home, it has so many unique features! The bright & airy living room has a custom fireplace w/ bookshelves on either side! It is open to the oversized dining room! The kitchen has been completely remodeled w/ stainless steel appliances, white shaker cabinets for tons of storage, low maintenance quartz counters & a floor to ceiling pantry! The large island countertop is great for food prep, serving or entertaining. From the island you can see right into the den that has multiple televisions hung & surround sound. It also has a wet bar with sink and mini fridge. But don't miss the theatre room to watch your favorite movie or sports game! It has tiered levels for seating, a projector screen & acoustic panels on the walls to minimize echo & ambient noise! The backyard is an entertainer's dream! As you enter the yard you will see a custom built in BBQ with refrigerator, warming drawers & single stove burner with seating & gas fire feature. There is also a cabana with granite counters all the way around it w/ a 6 person above ground jetted spa. From the spa, you can walk into the beach entry pool w/ swim up bar & 55 inch TV! The entertainer decks are great for getting some sun in the summer! The oversized garage is 12 ft in height & 31 ft deep! Great for RV, multiple cars or a workshop! Some tech features include Cat 6 wiring throughout the entire home so it's ready to be a smart interactive home & there is Ethernet Cables in every room!" "Exquisitely appointed custom villa with Tuscan and Spanish touches completely rebuilt in 2005. Vaulted ceilings with dramatic exposed wooden beams throughout. This property receives an abundance of natural light from its many windows and desirable orientation. 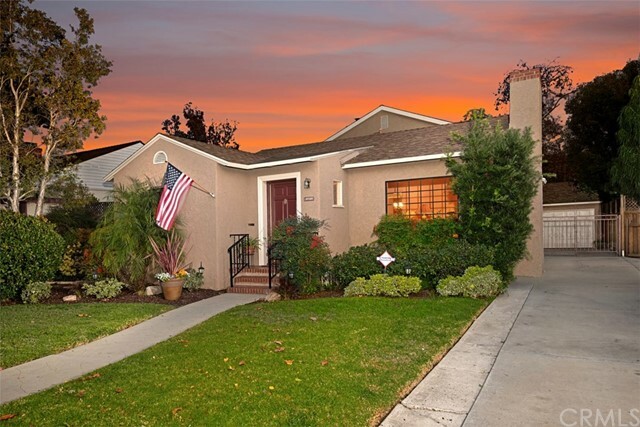 Located a short five-minute walk to Los Cerritos Elementary and Virginia Country Club. Move-in ready with upgraded kitchen and baths, arched entries, designer touches, Spanish chandeliers, wrought iron light fixtures and limestone flooring. The breakfast nook leads into a spacious Chef s kitchen with limestone countertops, custom cabinetry and a professional 6-burner stove. The adjacent formal dining room features a gorgeous custom stone fireplace, elevated ceilings and Tuscan pillars. Past the dining room is the prominent family room with stunning cathedral ceilings and stone fireplace. The elevated master suite has a full bathroom with spa, walk-in closet and a private balcony. Three bedrooms are on the entry level, one with an en-suite bathroom. The property has central heat and dual pane windows for energy efficiency. The gated motor court allows for privacy or additional parking. This home has been meticulously maintained inside and out and has terrific pride of ownership. You will not be disappointed! PRICED BELOW MARKET!" "Memorial Heights hill top home with views of the City. Three bedroom, three bath home on a large lot with a separate orchard. Built in 2003 with custom hardscape landscaping. Upgraded kitchen and bathrooms with central AC, new paint, dual glazed windows and high ceilings. Master bedroom suite features ceiling fan, a balcony with a City View and a spa tub in the master bath with separate tub and shower. Downstairs study is large and can be used as a 4th bedroom. Polished Cherry hardwood floor, recessed can lighting and an open floor plan combine to make this a lovely home. Large two car attached garage, upstairs laundry room with Travertine floor, walk in closets, plantation shutters, new ceiling fans, granite counters in kitchen, mature fruit trees and custom ironwork in the back yard are just the beginning of a features list. Owner completed a new kitchen remodel in 2018. New appliances, quartz counter and cabinets. The lot includes an orchard on an elevated lot adjacent the rear of the property." "Exquisite Mediterranean style 4 bedrooms, 4 baths pool home in the Historical District of Cal Heights. This upgraded custom-built home features a double door entry, open floor plan, architecture ceilings, 2 master bedrooms, (1 upstairs, 1 downstairs), large bedrooms, library, theater room, recessed lights through out, large walk-out balcony and a sparkling pool & spa. 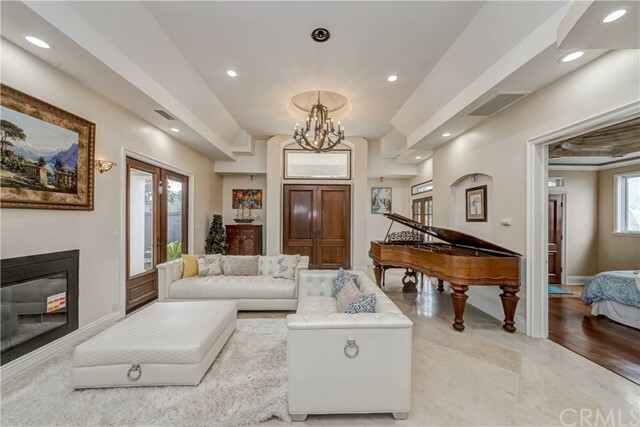 Open & spacious Living room with high architecture ceiling, recessed lights, recessed wall niche, fire places, 4 double french doors with a clear view and opens out to the pool, and travertine floor with decorative tile. Remodeled kitchen with new antique white cabinets, quartz counter top & breakfast bar, herringbone tile back splash, new stove and range hood, new dishwasher, new sink & faucet, garden window & crown molding. 2 bedrooms downstairs - Master BR with beautiful architecture ceiling, large walk-in closet, and 2nd BR with trey ceiling, ceiling fan and double French door to the pool. Remodeled downstairs bathroom-new contemporary frameless shower doors and mirrors. Beautiful forged iron stair rails and travertine steps to 2nd floor with a large skylight for natural light. Huge upstairs master BR with cozy fire place, ceiling fan, double French door to a large walk-out balcony, huge walk-in closet and library. Large pool and spa with a safety fence, a poolside shower and covered patio are perfect for outdoor entertainment and parties. Easy access- 405 and 710 freeways.Supplemental for List of Upgrades." "NEW LOWER PRICE! $81,000 LESS! Welcome Home To A Home Lovingly Known for 60 Years By Family and Friends as Home Sweet Home. 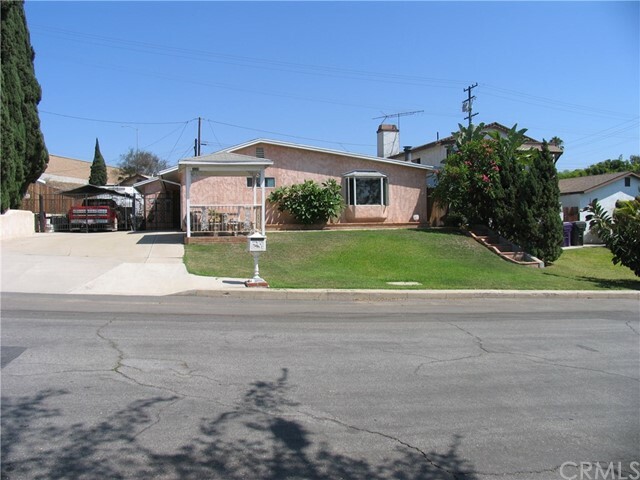 It is walking distance to Los Cerritos Park and Virginia Country Club. With eight bedrooms & four bathrooms it has an excellent floor plan for an extended family. 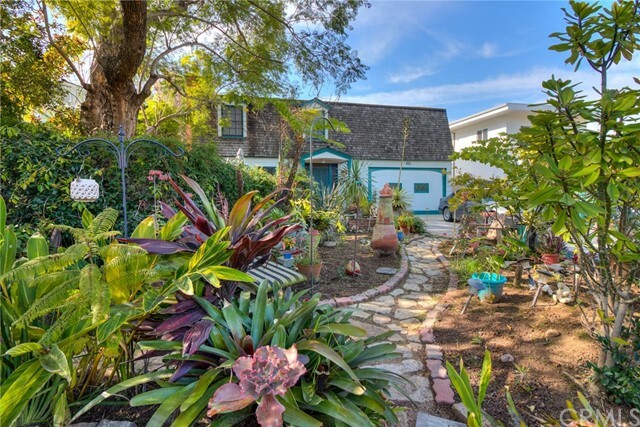 As you enter the property from the wide palm lined street you may be wonderstruck by the large woodsy front yard complete with exotic flowers, plants & trees. Pathways & inviting rest areas lead to a deck for reading, entertaining or just relaxing. The front door enters into a formal foyer leading into the dining room graced with an Art Deco chandelier, crown molding & large windows facing the backyard. The open living room features a cozy fireplace with Delft tile and also has crown molding & chair-rails. The chef's kitchen is complete w/Corian, oak & stainless steel counters,Thermador gas cooktop & custom cabinetry; also, a Sub Zero refrigerator, trash compactor, dishwasher, two separate sinks & built-in Oak dining table. The large utility room has laundry facilities with ample cabinets A service entry and A 3/4 bathroom. The butler's pantry has copious shelves & second refrigerator. Also downstairs are two bedrooms and full bath w/separate shower and tub. Upstairs has an added back-stair entry and boasts six bedrooms and two bathrooms. The lovely backyard is graced with a wood deck & pergola and classic red brick fireplace. The garage 440 watt power. This home has endless possibilities!" "Home recently appraised at $1,050.000. Click the supplements box for full report. Simply Beautiful and Amazing. What was once old (1949) has been made new again. Yes ! 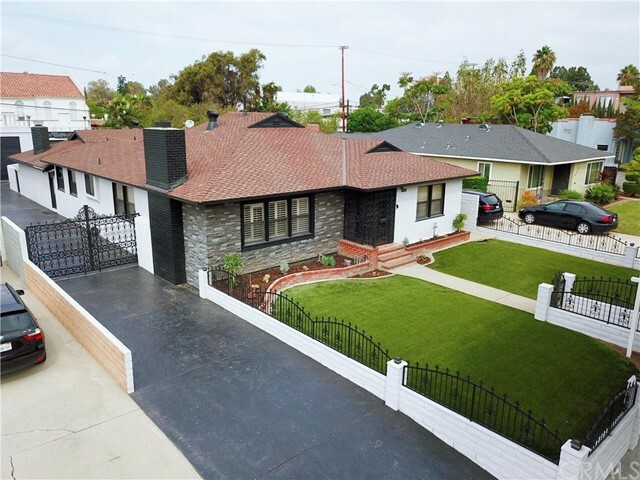 A new construction in the beautiful area of Bixby Knolls. This home was once a small 2 bedroom/1 bath bungalow which has been beautifully expanded into a spacious 4 Bedroom 3 bath dream home that satisfies what buyers are looking for today Open Concept Living. Seller spared no expense in bringing this once outdated, small bungalow into what it is today. 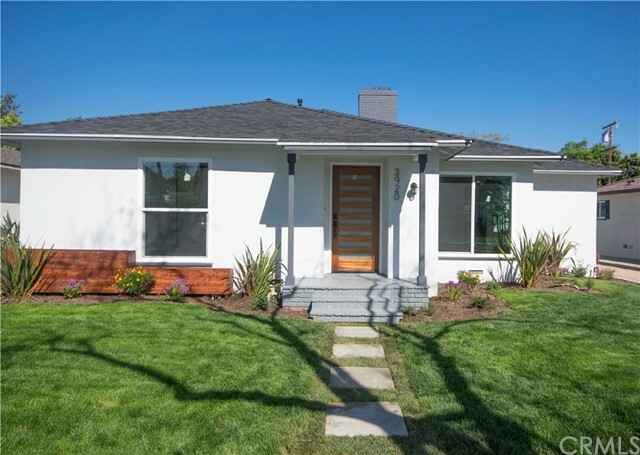 House was redesigned by a licensed architect, approved by the City of Long Beach and re-built to today's city and state building codes & energy efficiency standards. All is new: copper plumbing, electrical wiring and panel, drywall, roof, plumbing, insulation, split system HVAC, tank-less water heater, recessed lighting, windows/doors, high quality water proof laminate flooring throughout, stunning quartz counter tops in kitchen with large beautiful kitchen island & subway tile back splash, white shaker cabinets/soft close doors & drawers, GE Cafe Series & Monogram professional grade appliances, master bedroom with huge walk-in closet, plantation shutters. Landscape w/auto sprinkler/timing system. New over sized long driveway/RV parking. Own a new home on a beautiful tree lined street. So much history in this area, generations of families call this place home. Huge lot, plenty of room to add a pool/guest house." "Determined to transform their family s 1924 bungalow into a modernist home, Mr. & Mrs. Pekrul turned to Long Beach architect Paul Tay. By way of his spectacular 1968 addition, they achieved that and more. 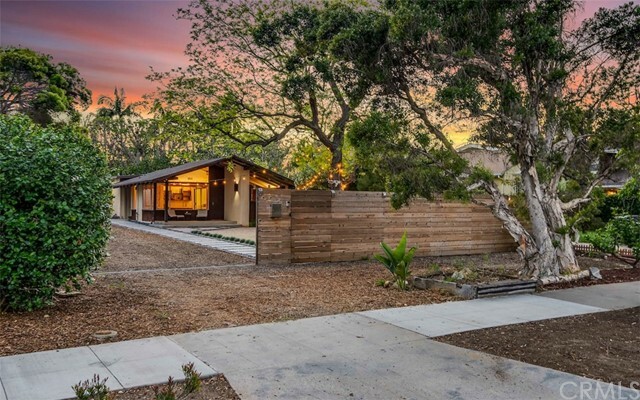 The result is an inspiring light filled space, sheltered behind privacy fencing and mature trees on a generous, nearly 9,000 square foot lot. It stands today as a time capsule of 60 s modernism. Rough sawn Redwood ceiling, custom built soffit lighting, wrap around and clerestory windows, hand painted tile, beautiful Teak cabinetry and built-ins- all remain gloriously intact. Sliding glass doors access a central courtyard, which visually connects Tay s addition with the original 1920's home. Cork flooring has been laid throughout, merging the Tay addition to the crisp white palette of the newly reconfigured original home. The current owner s renovation has given it new life; with a revised layout that creates a proper master suite, enlarged guest bedroom, and 3rd bedroom/office with access to the rear yard and patio. Closets have been finished to maximize the use of space. Intriguingly, Tay also created drawings for a phase two addition. Never built, it planned for an expanded living space, entrance foyer, and two car carport at the front. 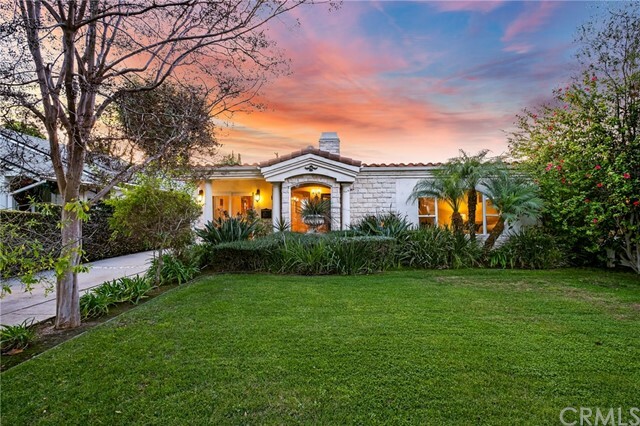 Situated on a prime parcel in Long Beach s prestigious Virginia Country Club neighborhood, yet giving the impression of being somewhere far from the city." "Welcome to 4310 Myrtle! 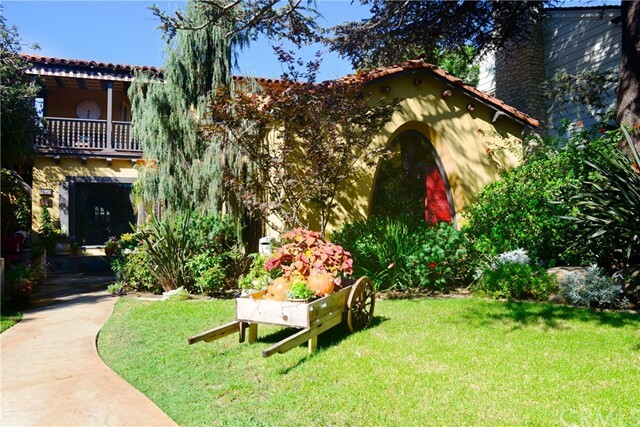 This Kenneth Wing designed home in the heart of Bixby Knolls boasts over 2,400 sq ft and has charm to spare! Located within walking distance to all the shops & restaurants on the bustling Atlantic Ave. corridor, this is the perfect place to call home. This property has been owned and tenderly cared for by the same family for over 40 years. With 3 large bedrooms, 2 bathrooms with original features & character, sun-filled kitchen w/ patio access, formal dining room, ample sized living room w/ fireplace, an office w/ great built-ins & not to mention an incredibly large bonus room off of the landscaped backyard (not counted in the sq footage) - 4310 Myrtle is the ideal place to spend time w/ family & friends." "This is the Style and Sophistication you have been looking for! Each room has been Artistically Designed to Perfection! The Pristine Open Concept Kitchen was upgraded with an Expansive Butcher Block Island and finished with a Herringbone Pattern Subway Backsplash. The Master Bedroom Suite is a True Masterpiece with an Oversized Custom Shower and Luxurious Soaking Tub. Additional Upgrades include a New Roof, New Windows, New HVAC, New 200 Amp Panel and Electrical Wiring. Don t miss out ~ Your New Home Awaits!" 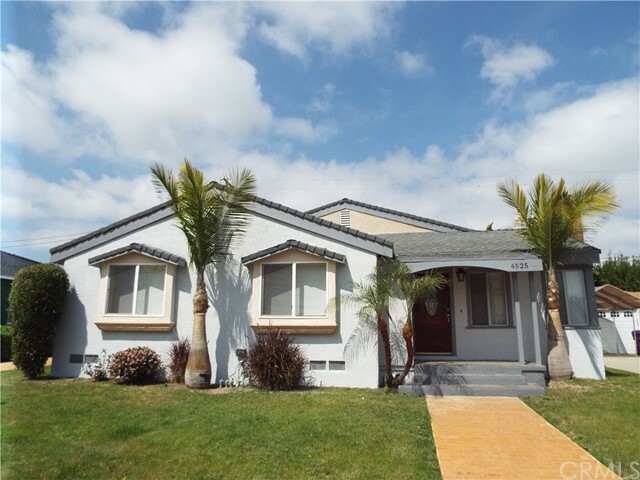 "Expansive home located in California Heights offering over 2800 square feet of living space. This home has been in the same family for nearly 50 years and has been lovingly maintained and smartly upgraded. With four bedrooms, two bathrooms, a formal dining area, and family room, there s plenty of room for everyone. Enjoy the stately fireplace in the living room, gorgeous hardwood floors, and additional fireplace in the den including a view of the lush atrium, tons of kitchen storage and eat in area. Bathrooms have been updated with new tile and granite countertops. Relax in your oversized master bedroom and remodeled master bath complete with soaking tub. Plenty of room in the separate large laundry room with extra storage cabinets and sink. Entertain in the beautifully landscaped backyard complete with an in ground spa. Do not miss this one!" "Welcome to this charming home with many possibilities. Enter through the front gate into your own private courtyard with lush lawns and flowerbeds. The beautiful wood double doors invite you in. Natural light floods nearly every room in this spacious home through the newer vinyl windows. Downstairs boasts a spacious formal living and dining room, cozy family room and office (which could be easily converted to a bedroom) with half bath attached. Kitchen is spacious and features black granite counters and solid wood cabinetry. Up the wide flight of stairs you will find four good-sized bedrooms, one with an en-suite bathroom. Follow the hallway to the deck, the crowning glory of this home; spacious enough for a party, but private enough for a romantic sunset for two. The front yard stretches the length of the 3 car deep driveway, and has the zoning possibility of adding a front yard guest house or ADU. Rebuilt from the ground up in 2008, this is the only home in the neighborhood that can boast such claims. Contractor enlarged the footprint of the original home, adding over 800 sq. feet. This does not happen easily in this historic neighborhood! All systems of this house are new as of '08 - plumbing, electrical, wiring, heating, a/c, etc. Interior was recently painted and has newer carpet and laminate floors. This home has many great features...come make it your own! 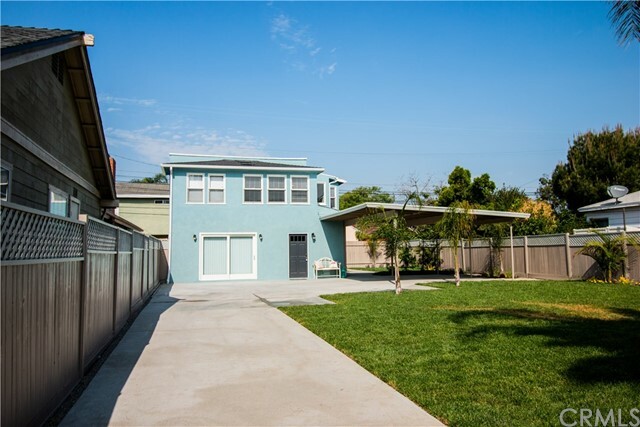 Just minutes to the 405 and many restaurants, shops, and schools, including highly-rated Longfellow Elementary." 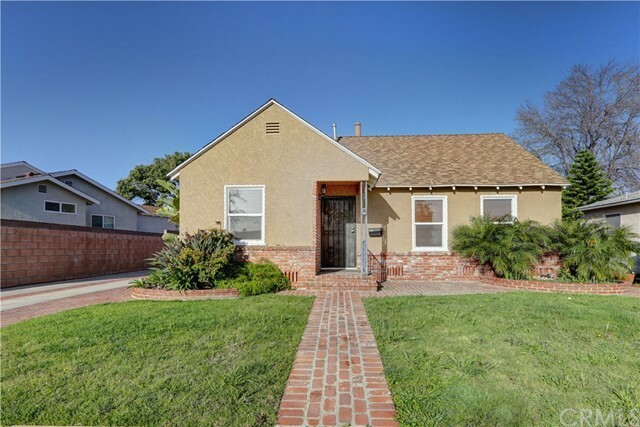 "Remodeled 4 bedrooms, 2 baths home. Manicured front lawn. Pop-up design windows. Open concept living room with a formal dining area. Bamboo flooring, recessed lighting, and a wood burning fireplace. Open kitchen, family area combination. Island with granite counters. Black kitchen sink to match dark granite counters. Travertine tile back splash in kitchen, along with recessed lighting, stove, microwave, and dishwasher. First bedroom has dark laminate flooring, and beveled frame-less closet mirrors. Dark laminate flooring in second and third bedrooms. All windows are vinyl, double pane, with round beaded frames. New cordless blinds. First bathroom has a cast iron tub, porcelain tile on wall to above water line with Travertine tile accents, and a custom vanity and mirror. Large master bedroom with dark laminate flooring. Recessed lighting. 2 closets. A regular, and a walk-in one. Porcelain floors in master bath. Cast iron tub. Travertine tiles in bath to above water line, and custom vanity and mirror. Private access to outside area off master bedroom. 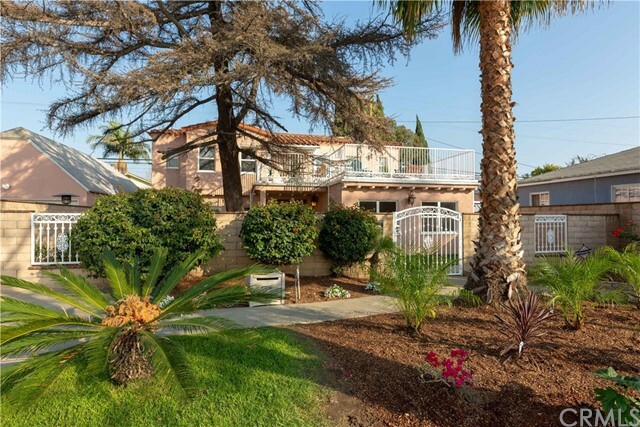 The private, fenced, outside patio has custom made cement flooring. Large deck for entertaining. 2 palm trees, and the possibility of adding a flower garden around deck. There's ample sitting. 2 car garage with plenty of parking space in driveway. Home is piped for A/C. Award winning schools. 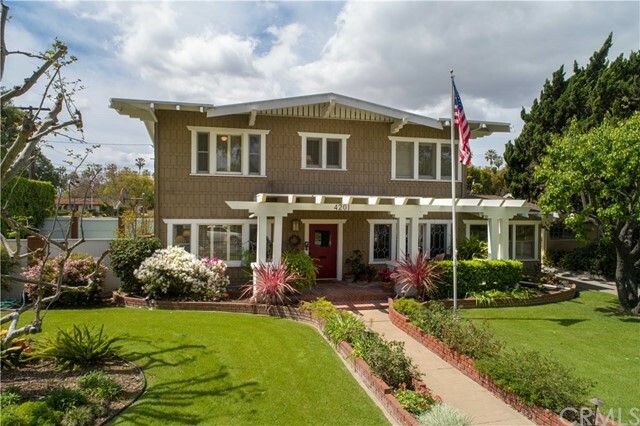 Close to 3 parks, golf courses, freeways, and the lively Bixby Knolls' Atlantic Avenue restaurants, pubs, and shops. Come and see." "Welcome home to this spectacular Spanish styled 3 bedroom 1 bathroom, beauty. A clay tiled roof along with vibrant and cheerful turquoise accents, warmly greet you curbside and at your private carport. Vaulted arch ceiling, stained wood doors and trim, richly stained hardwood floors, a grand wood burning fireplace and featured scalloped archways between the living and dining room are unique and tasteful features of this home, showcasing the time period it was built. You will appreciate the craftsmanship of the stepped raised dining room ceiling and the charming windows with laced curtains, french door leading to the backyard and beautiful glass knobs adorn every door in the home. An additional scalloped archway is located in the kitchen with leaded glass cabinet doors, a light and bright garden window and designer pendant lighting. The home boasts a private master bedroom with built in drawers in the closet. The third bedroom/media room has 2 french doors that lead to the breathtaking backyard retreat with an avocado tree that produces delicious creamy avocados all year round. The private and well maintained backyard has a variety of flowering plants and citrus trees, including an outdoor shower. The colorful mature landscaping provides a beautiful outdoor living space for you and your family and friends to enjoy. Come and visit this rare beauty now." "Gorgeous Home!!! Large 4 bedroom 2.5 bath home with various upgrades. Property has new paint inside and out, new kitchen with quartz counter tops. New Recessed lighting throughout, with dimmers. New Flooring and so many other touches. Must see to appreciate the details and comfort of this lovely home." "Wow! Location, Location, Location! Welcome to 652 Avery Place. Located on a prime raised corner lot, in the private, gated community of Crowne Pointe within the prestigious Virginia Country Club area of Long Beach. This patio/town home was designed to entertain and the raised corner lot allows for lots of bright, natural light to fill the open floor plan, treetop city lights views as well as a surrounding yard and patio areas. Featuring a spacious living room with fireplace and wet bar off the dining area as well as a gourmet kitchen with an oversized cooking island and bar seating adjacent to a separate dining room. All 3 bedrooms have their own bathrooms. The downstairs bedroom has a full bath perfect for guests. The 1st master suite upstairs has a full bath and large closet. The main master bedroom suite is huge, with vaulted ceilings, a wall of closets, a large bath with soaking tub and separate shower, as well as an adjacent sitting area with a cozy fireplace, that opens to a patio to enjoy morning coffee, a book or just the views. There's also a detached 2 car garage, plantation shutters throughout, forced air heat and central A/C and all existing appliances are incl. 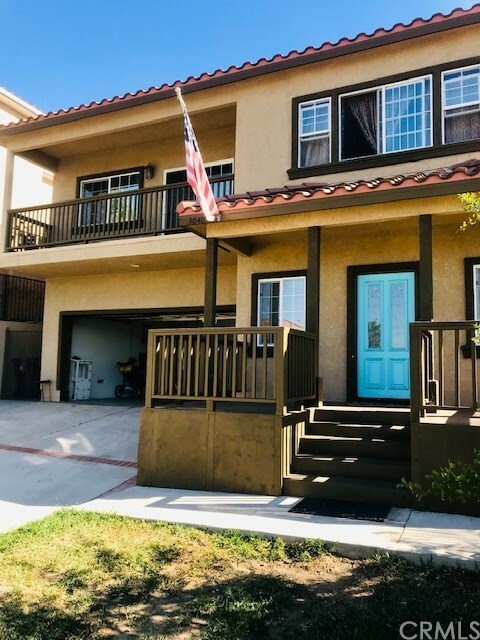 Located in a blue ribbon school district, with nearby schools including Los Cerritos Elementary, Oakwood Academy Preschool & Kindergarten and Hughes Middle School. 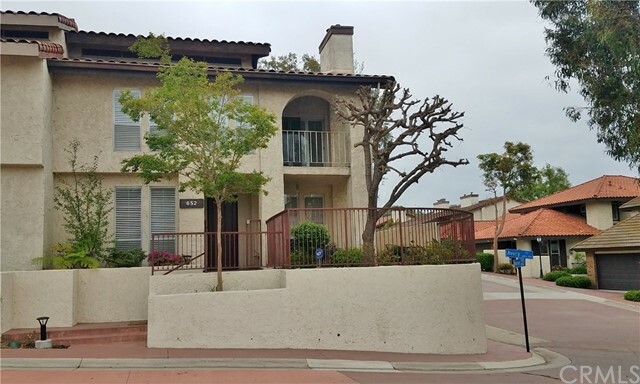 Close to freeways, the Metro Blue line, stores, hip, trendy and fun coffee shops, restaurants as well as parks and LB is a very bike-able city." 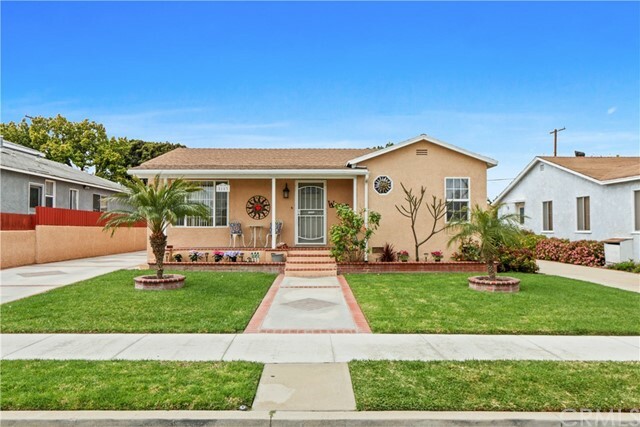 "See this quintessential Long Beach Home! The main house is situated in the rear of the property freeing up plenty of garden space. Ideal property to build an Accessory Dwelling Unit (grandma cottage) in the front. This home features a mini-split air condition/heating units for each individual room. Home is located in the historical district. Fencing around the entire perimeter giving a true sense of privacy. It features 2 bedrooms 2 baths with walk in closets and a storage room/office area. The property has been rehabbed with many features; new kitchen, bathrooms, laminate floors, appliances, tank less water heater, new roofing shingles, updated plumbing and electrical. The long drive way has been repaved and could fit up to 6 cars or more! Hurry and don't miss this great opportunity to buy this jewel of a house! Close to quaint restaurants and shopping." "Welcome home!! To a beautiful, fully remodeled home- with all the upgrades and space you can ask for! Exterior includes: Well-kept landscape throughout, brick design in the front, driveway and backyard. A raised foundation, with a tall attic space- for additional insulation. Backyard has two wooden awnings for shade to entertain. Double pane windows throughout. New AC unit. Interior includes: beautiful easy to clean tile floors in entry, dinning area, kitchen and bathrooms. Recessed lighting. Granite counter tops in kitchen, & bathrooms. Spacious kitchen with dishwasher, lots of cabinets space. Natural lighting shines through the dining area. One bathroom features double granite sinks & tub with shower. Other bathroom has a granite sink & shower. ALL THREE BEDROOMS ARE LARGE!! Common area is LARGE with a cozy fireplace and double sliding doors that lead to the backyard. This home is very spacious!! Don t miss out!" "Thoroughly updated and impeccably maintained. Newly refinished red oak flooring w/new baseboards. Kitchen updated w/newer white cabinets, travertine flooring, marble counters & tile back splash w/stainless mosaic tile behind range. Stainless appliances include range hood, dishwasher & double sinks. Living room looks out to the street through a bay window and there is a brick fireplace w/wood mantel. Dining room adjacent to kitchen. Two bedrooms flank the hallway that leads to the larger master located at the rear of the property. The common bath has updated hexagonal mosaic marble flooring & updated vanity and sink. Master bedroom w/walk in closet & private full bath w/ceramic tile tub surround and French doors leading to the yard. At the rear of the property is a concrete patio & grass area w/ a jacuzzi located behind the garage that stays. In addition to the two car garage there is a small bonus storage/ workshop room at the rear of the garage, perfect for a workshop, office or ADU (Accessory Dwelling Unit) as there is already plumbing in the area. Additional features include copper plumbing, updated electrical panel, auto gar door opener & auto sprinklers. Laundry in the garage w/additional laundry sink. Original touches include telephone cubby & the original mailbox slot. 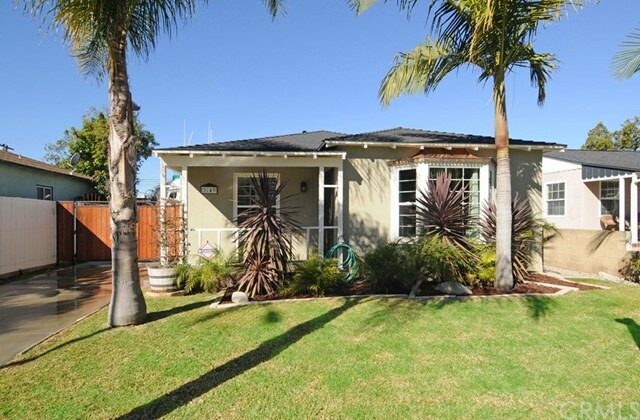 The lucky new owner of this home will have a truly well loved and maintained home with lots of charm and functionality. There is plenty of room for RV parking, 33' in front of gate and 46' behind gate." "Move-in Ready! 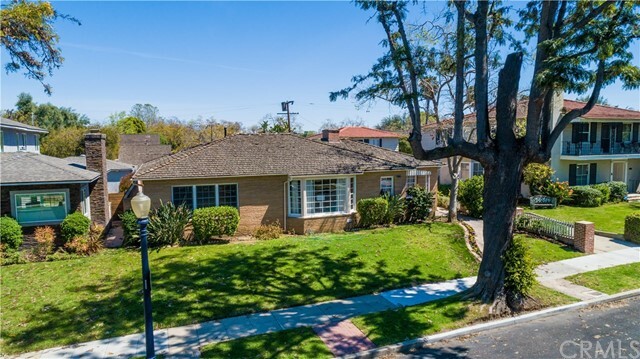 This beautifully property is located in the prestigious area of Ridgewood Heights, Bixby Knolls. Enjoy an upgraded kitchen perfect for entertaining guest, oak kitchen cabinets, dual pane window(s), porcelain floor throughout the home, wood floor underneath carpet in bedroom(s) and an amazing lay out !!! Gorgeous brick yard patio/porch perfect for entertaining guest during the hot days that come ahead, fireplace located in living room, master bedroom with master bathroom, lots of kitchen counter space. Appliances are negotiable with the purchase: Dishwasher, Refrigerator, Stove, Microwave, Washer & Dryer. This home also includes a sprinkler system, landscaped front and back yard, 2 car garage with two additional car spaces. This house will not disappoint you. Look no further, this is the one!" "Great financing available as Owner is willing to Carry part of the financing for this Unique property. Extra Long Driveway for Recreational Vehicle(RV) or Boat. Master Craftsman lives here. Must see to appreciate the beautiful workmanship throughout the home. Oak cabinets accentuate this fine home with skylights throughout. Workshop with outside bathroom will be appreciated by anyone handy minded. Skylights throughout. Interior laundry. Front room bay windows overlooks front yard Gazebo, which affords a relaxing experience. Forced air Heating. Estimated 7 to 9 parking spaces provided by large driveway."